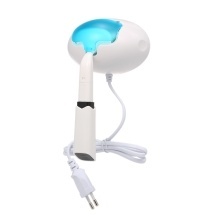 This portable facial cleansing brush and sanitizer kit is wonderful for daily use and travel use. Helping you to keep your facial skin clean and healthy. Come and bring it home. Super soft facial brush, made of advanced fiber hair, suitable for all skin types, gives efficient and gentle cleansing to different skin types. A combination of facial cleansing brush and a face massager, keeping you away from aging skin and helping you diminishing wrinkles. Wireless design, powered by 1 * AAA battery(not included), convenient for you to use at anytime anywhere. Facial brush sterilizer, compact size, useful for drying facial brush, killing the virus and germ and protecting your health. Dustproof and waterproof design, easy for you to keep it clean, a wonderful choice for you to clean your face.